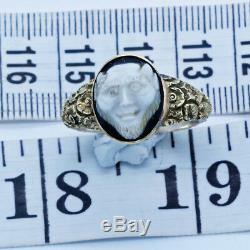 14k gold, hardstone carved cameo. 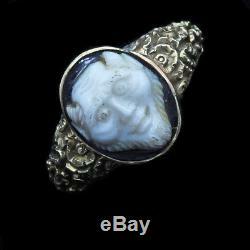 Cameo could be original from Roman times, but we do not know whether it is from that period or later. Made for a gentleman, but also suitable for a woman. Measurements: US size 8.5. Weight is 5.5 grams. Description : Exceptional ring in every way. The shank with repousse gold work all the way from the bezel to the tapering sides. Very rich flowers, shells and foliage in full and rich design, clearly showing attention to luxury and workmanship. 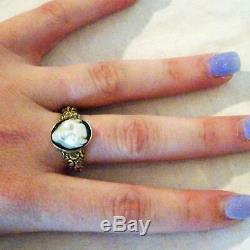 The bezel in a small raised gold collette is a hardstone cameo. 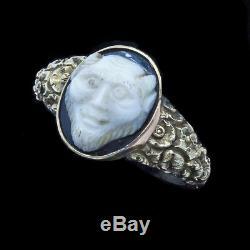 The ground is dark with the carved away upper white section depicting a satyr or satan. Wonderful detail in a fantastic depiction. 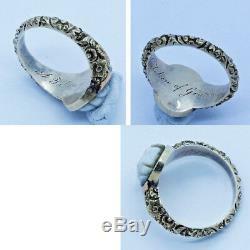 The closed back with sentimental message (poesy) engraved in the shank in script: A TOKEN OF GRATITUDE. 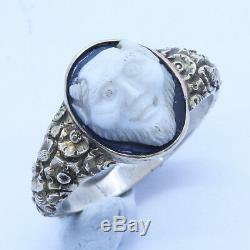 Makes a superb, unique and original gift for any gentleman. Gold was acid tested to ensure metal purity. Condition: Good with minor wear commensurate with age. Please see enlarged pictures and don't hesitate to ask questions which we will do our best to answer. Add Me to Your Favorite Sellers. We would appreciate it if you notify us in advance, and explain the reason for the return. Please pack carefully to ensure the item reaches us in the same condition it left here and don't forget to insure and track properly. These charges are the buyers responsibility. 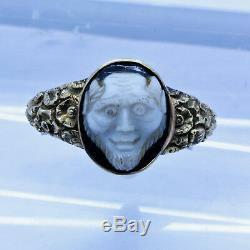 The item "Antique Victorian Poesy Man's Ring Cameo Satyr Satan 14k Gold Carved (6654)" is in sale since Friday, January 18, 2019.